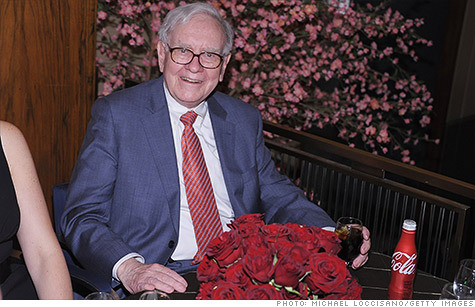 For $3,456,789, an anonymous bidder gets to have lunch with Warren Buffett in New York. NEW YORK (CNNMoney) -- An anonymous bidder is paying a record $3,456,789 to have lunch with legendary investor Warren Buffett, according to the charity that benefits from the auction. Glide, the San Francisco Bay anti-poverty organization, said there were 10 active bidders among the more than 110 inquires into the auction on eBay (EBAY, Fortune 500). The auction began Sunday and closed at 10:30 p.m. ET Friday. "We are shouting, dancing, rejoicing and celebrating. It's quite an experience," said Glide founder, the Rev. Cecil Williams, in a statement. "We have made history, thanks to Warren Buffett." Over the last decade, Buffett has raised more than $11.5 million for the organization, not counting the 2012 auction. The 2012 winning bid topped by more than $800,000 last year's prior record bid of $2,626,411 to dine with the "Oracle of Omaha." Both the 2011 and 2010 auctions were won by Ted Weschler, a former managing partner of Peninsula Capital Advisors. Buffett hired Weschler in September after sitting down for their multi-million-dollar meal last summer. The chairman and chief executive of Berkshire Hathaway (BRKA, Fortune 500) will join the winner of this year's auction and seven friends for lunch at the Smith & Wollensky steakhouse in New York at a mutually agreed upon date.